I smile every time I see this when I leave work. 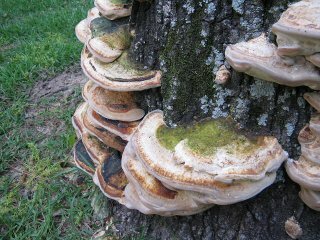 I think they are called fairy stairs, although they look more like pancakes embedded in the stump by a tornado. You can see the full-sized image in my fairy stairs photo set at Flickr. Pixelated Dreams (12 comments) on Does it matter whether you are a simulation?